One of the most important moments in Star Wars history plays out on your iPhone and iPod Touch today, as THQ Wireless releases Star Wars: Trench Run. 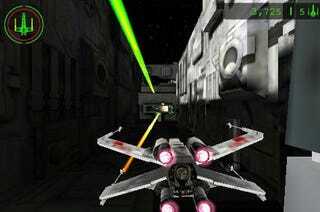 Take part in the Battle of Yavin as a member of Rebel Alliance's Red Squadron, dog fighting with TIE Fighters before aiming for the most poorly-designed exhaust ports in the history of exhaust port design in Star Wars: Trench Run for the iPhone and iPod Touch. While THQ Wireless doesn't specify which member of the Red Squadron you are, the ability to use Force powers to slow down enemy fighters and increase your agility is a bit of a giveaway, unless of course they've secretly revealed that a Red Squadron member other than Luke had the Force that day and just wasn't telling anyone. The game features sounds and music from the original films, along with footage to help refresh your memory in case you'd forgotten that bit, and boasts True-Life, accelerator-based flight controls. True-Life space combat physics? I bet that was one expensive research trip. The game is now available for $4.99 in the App Store. As an added plus, it runs better on the 3GS and 2nd generation iPod Touch, giving owners of those devices something to brag about while the rest of us wait for the upgrade opportunity. Jerks.